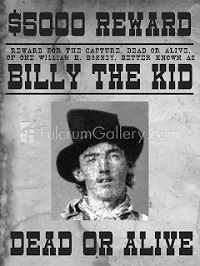 The latest death threat against Bill Windsor is the posting of a $5,000 dead or alive reward poster in an article about Windsor titled "Billy the Kid." Bill Windsor received news of this in an email with a link to the "veiled" threat. 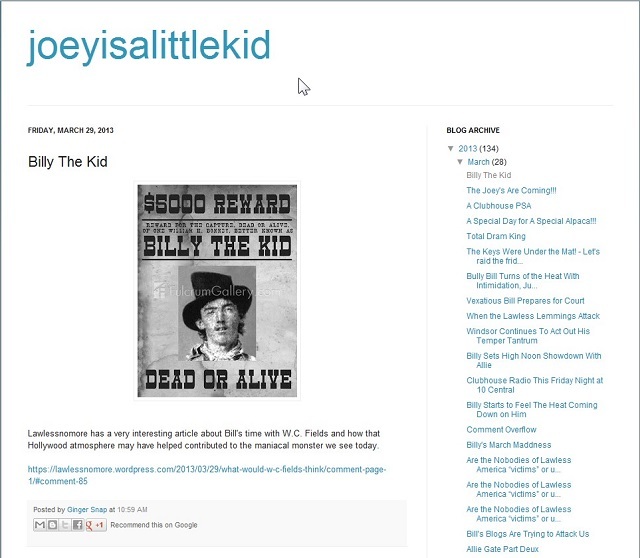 The wanted poster is on http://joeyisalittlekid.blogspot.com, a website that operates 24-hours-a-day to discuss Bill Windsor. Those who frequent this site include "Justin Thompson," Michelle Stilipec, Brannon Bridge, Megan Van Zelfden, Curtis Butler, and a few others. A number of these people are said to use dozens of aliases to make it seem like people actually read the site and comment. Others have sued the website. A California couple recently won a default judgment. As much as Bill Windsor dislikes the many threats that he receives because he is exposing liars and corruption, things like this add to the evidence against deranged individuals. In related activity, the American Mothers Political Party continues to produce videos to "honor" Bill Windsor. There are now as many as 30 or 40 tribute videos to Bill Windsor. A video that has been banned from YouTube will be shown at Bill Windsor's "trial" in Lexington, Missouri on April 8, 2013. It very effectively demonstrates just how crazy folks like these are capable of doing just about anything.